With a rapid pace in evolution of Big Data, its processing frameworks also seem to be evolving in a full swing mode. Hadoop (Hadoop 1.0) has progressed from a more restricted processing model of batch oriented MapReduce jobs to developing specialized and interactive processing models (Hadoop 2.0). With the advent of Hadoop 2.0, it is possible for organizations to create data crunching methodologies within Hadoop which were not possible with Hadoop 1.0 architectural limitations. In this piece of writing we provide the users an insight on the novel Hadoop 2.0 (YARN) and help them understand the need to switch from Hadoop 1.0 to Hadoop 2.0. With the introduction of Hadoop in 2005 to support cluster distributed processing of large scale data workloads through the MapReduce processing engine, Hadoop has undergone a great refurbishment over time. The result of this is a better and advanced Hadoop framework that does not merely support MapReduce but renders support to various other distributed processing models also. The huge data giants on the web such as Google, Yahoo and Facebook who had adopted Apache Hadoop had to depend on the partnership of Hadoop HDFS with the resource management environment and MapReduce programming. These technologies collectively enabled the users to manage processes and store huge amounts of semi-structured, structured or unstructured data within Hadoop clusters. Nevertheless there were certain intrinsic drawbacks with Hadoop MapReduce pairing. For instance, Google and other users of Apache Hadoop had various alluding issues with Hadoop 1.0 of not having the ability to keep track with the flood of information that they were collecting online due to the batch processing arrangement of MapReduce. Hadoop 2.0 popularly known as YARN (Yet another Resource Negotiator) is the latest technology introduced in Oct 2013 that is being used widely nowadays for processing and managing distributed big data. 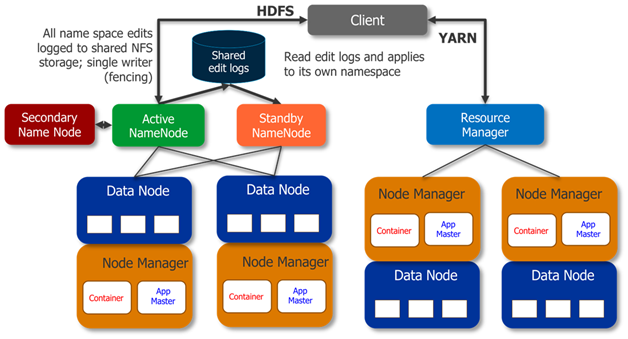 Hadoop YARN is an advancement to Hadoop 1.0 released to provide performance enhancements which will benefit all the technologies connected with the Hadoop Ecosystem along with the Hive data warehouse and the Hadoop database (HBase). Hadoop YARN comes along with the Hadoop 2.x distributions that are shipped by Hadoop distributors. YARN performs job scheduling and resource management duties devoid of the users having to use Hadoop MapReduce on Hadoop Systems. Hadoop YARN has a modified architecture unlike the intrinsic characteristics of Hadoop 1.0 so that the systems can scale up to new levels and responsibilities can be clearly assigned to the various components in Hadoop HDFS. The foremost version of Hadoop had both advantages and disadvantages. Hadoop MapReduce is a standard established for big data processing systems in the modern era but the Hadoop MapReduce architecture does have some drawbacks which generally come into action when dealing with huge clusters. Hadoop 1.0 Architecture had only one single point of availability i.e. the Job Tracker, so in case if the Job Tracker fails then all the jobs will have to restart. The Job Tracker runs on a single machine performing various tasks such as Monitoring, Job Scheduling, Task Scheduling and Resource Management. In spite of the presence of several machines (Data Nodes), they were not being utilized in an efficient manner, thereby limiting the scalability of the system. In case of Hadoop MapReduce when the number of nodes is greater than 4000 in a cluster, some kind of fickleness is observed. The most common kind of failure that was observed is the cascading failure which in turn could cause the overall cluster to deteriorate when trying to overload the nodes or replicate data via network flooding. The major issue with Hadoop MapReduce that paved way for the advent of Hadoop YARN was multi-tenancy. With the increase in the size of clusters in Hadoop systems, the clusters can be employed for a wide range of models. Hadoop MapReduce devotes the nodes of the cluster in the Hadoop System so that they can be repurposed for other big data workloads and applications. Nevertheless, with Big Data and Hadoop, ruling the data processing applications for cloud deployments, the number of nodes in the cluster is likely to increase and this issue is addressed with a switch from 1.x to 2.x. This is not just the end of the limitations coming from Hadoop MapReduce apart from the above mentioned issues there were several other concerns addressed by Hadoop programmers with version 1.0 such as inefficient utilization of the resources, hindering constraints in running any other Non-MapReduce applications, running ad-hoc queries, carrying out real time analysis and limitations in running the message passing approach. 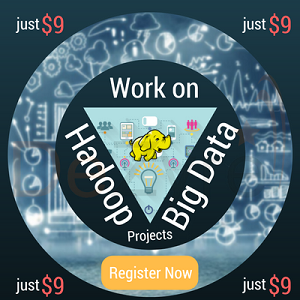 Want to learn big data processing using Hadoop 2.0 YARN? Join our Hadoop Training Classes to become a Hadoop Expert! This is an infrastructure component that takes care of monitoring the nodes, allocating the resources and scheduling various jobs. This component is for the users to program various MapReduce applications. This component is for all the runtime services such as Shuffling, Sorting and executing Map and Reduce processes. The major difference with Hadoop 2.0 is that, in this next generation of Hadoop the cluster resource management capabilities are moved into YARN. YARN has taken an edge over the cluster management responsibilities from MapReduce, so that now MapReduce just takes care of the Data Processing and other responsibilities are taken care of by YARN. This component is considered as the negotiator of all the resources in the cluster. Resource Manager is further categorized into an Application Manager that will manage all the user jobs with the cluster and a pluggable scheduler. This is a relentless YARN service that is designed for receiving and running the applications on the Hadoop Cluster. 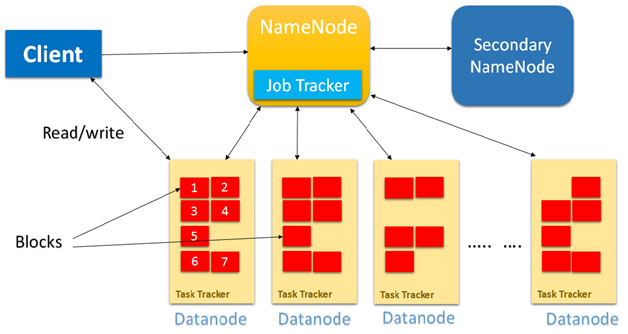 In Hadoop 2.0, a MapReduce job will be considered as an application. This is the job history server component of YARN which will furnish the information about all the completed jobs. The NM keeps a track of all the users’ jobs and their workflow on any particular given node. This is the component where the job actually resides and the Application Master component is responsible for managing each and every Map Reduce job and is concluded once the job completes processing. 3.It is responsible for negotiating the resources of the system amongst the competing applications. 1.Node Manager communicates with the resource manager. 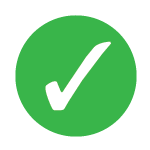 1.There is one AM per application which is application specific or framework specific. 2.The AM runs in Containers that are created by the resource manager on request. With the advent of YARN framework as a part of the Hadoop 2.0 platform, there are several applications and tools available now for Hadoop programmers that will help them make the best out of big data which they never thought of. YARN has been capable of providing the organizations something that is far beyond Map Reduce, by separating the cluster resource management function completely from the data processing function. With comparatively less overloaded sophisticated programming protocols and being cost effective, companies preferably would like to migrate their applications from Hadoop 1.0 to Hadoop 2.0. 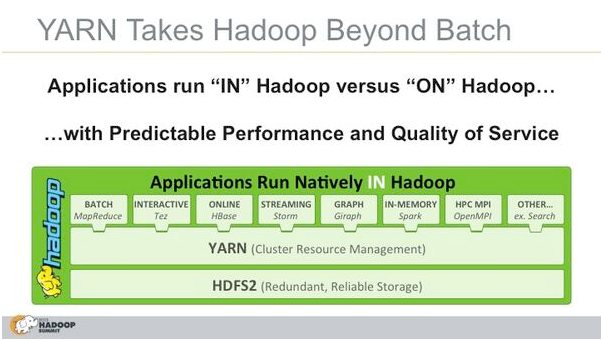 An edge that YARN provides to Hadoop Users is that it is backward compatible (i.e. one can easily run an existing Map Reduce job on Hadoop 2.0 without making any modifications) thus compelling the companies to migrate from Hadoop 1.0 to Hadoop 2.0 without even giving it a second thought. Despite the fact that most of the Hadoop applications have migrated from Hadoop 1.0 to Hadoop 2.0 there are migrations that are still in progress and companies are consistently striving hard to accomplish this long needed upgrade for their applications. With Hadoop YARN, it is now easy for Hadoop Developers to build applications directly with Hadoop, devoid of having to bolt them from any other outside third party vendor tools which was the case with Hadoop 1.0.This is another important reason why companies that are currently using Hadoop, will establish Hadoop 2.0 as a platform for creating applications and manipulating data for more effectively and efficiently. YARN is the elephant sized change that Hadoop 2.0 has brought in but undoubtedly there are lots of challenges involved as companies migrate from Hadoop 1.0 to Hadoop 2.0 however the basic changes to the MR framework will have greater usability level for Hadoop in the upcoming big data scenarios. Hadoop 2.0 being more isolated and scalable over the earlier version, it is anticipated that soon there will be several novel tools that will get the most out of the new features in YARN (Hadoop 2.0). Get IBM Certification for Big Data Hadoop to land a top gig as a Hadoop Developer at one of the top big data companies!